The Falklands may be a small, remote and sparsely populated archipelago, but it punches well above its diminutive size when to comes to wildlife, diverse scenery and the friendliness of the islanders who call this island outpost ‘Home’. 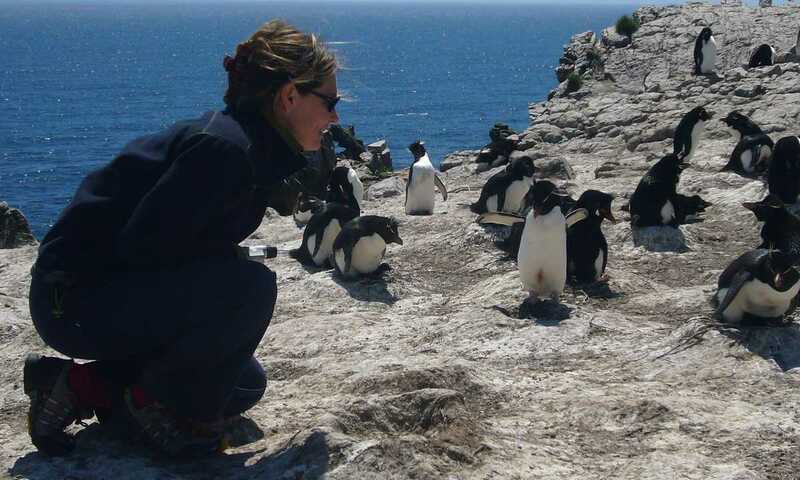 One of the best places in the world to see penguins - 5 different species - more penguins than people! It’s true to say that if The Falklands Islands were easier to get to they would receive significantly more visitors each year, particularly to see the island’s impressive wildlife. The birdlife alone - 227 known species - is incredibly diverse for such a small area, making it a birding mecca. The chance to see up to 5 of the world’s penguin species - gentoo, magellanic, macaroni, rockhopper and king - is also a big drawcard. The sight of small groups of resplendent kings marching along empty white beaches is unique and makes for great photo opportunities. And then there are significant populations of lazing sea lions, giant elephant seals hauled up amongst the tussock grass and whales and dolphins aplenty offshore. Statistics aside, what makes the Falklands wildlife so special is how accessible it is; it’s far from uncommon for the patient observer to be approached by a curious penguin or inquisitive caracara. Although it is now sadly extinct, the Falkland Islands Wolf or 'Warrah' has a fascinating history. Described by Darwin as a wolf-like dog, the 'Warrah' was the only predator on the islands. They were hunted for their fur by settlers on the island and poisoned by farmers who saw them as a threat to their sheep. The Falkland Islands Wolf became extinct in the 1870s and the closest living relative is the Maned Wolf, a rare canid which roams the grasslands of South America. Comprised of two principal islands - East & West Falkland - but counting 776 islands in total, this isolated Atlantic archipelago’s nearest neighbours are Patagonia, 300 miles (483 kilometres) to the east, and South Georgia. From a landscape point of view there is nowhere else quite like The Falklands. Sparsely populated, unspoilt, raw and diverse are the words which most succinctly sum up the island's scenery. Perfect white sandy beaches, rolling golden hillsides, towering cliff faces, rocky promontories and unique ‘stone runs’ flowing down the mountains like rivers provides a small window into the startling geographical diversity of what you will find. First claimed by the British in 1763, islanders to this day remain fiercely loyal to the Crown. The Falklands however hasn’t been free of controversy through its 500 year history with France, Spain and Argentina all having looked to exert authority at various times. When discovered the islands were uninhabited, but the nineteenth century saw Stanley become one of the world’s busiest ports, while the introduction of Cheviot sheep was a game changer for the island's economy. For many visitors, including veterans, the more recent 1982 conflict is the most historically significant and every islander has their own stories. While peace has returned to these sleepy islands, vestiges of that time are still plainly visible. The Falkland Islands may be very remote but they leave a lasting imprint on those fortunate enough to visit. 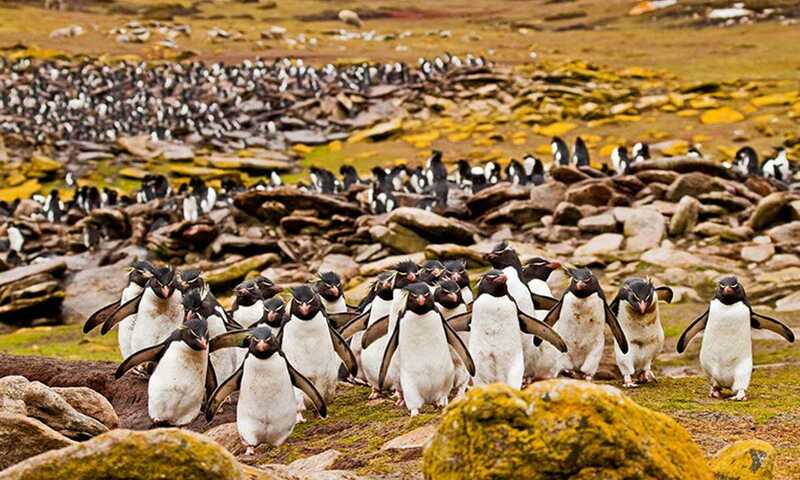 The visitor season on The Falklands typically runs through from October to April. The more favourable months are November to February when the weather is clearer and average temperatures around 8 degrees centigrade/ 46 fahrenheit, although the weather is still very changeable. Fly from Chile - There’s a weekly scheduled flight on Saturdays only beginning in Santiago and flying via Punta Arenas to The Falklands airport at Mount Pleasant. The flight between Punta Arenas and The Falklands takes approx. 1 hour 35 mins and is operated by LatAm. This is the most common way of getting to The Falklands. Cruise from Ushuaia, Argentina - Between late October and the end of March, small expedition ships with capacity of 50 - 200 passengers depart from the Argentine port city of Ushuaia. It takes approx. 36 hours hours to sail from Ushuaia to Stanley. Typically 18 - 23 days in length these voyages also visit South Georgia and Antarctica, as well as The Falklands. 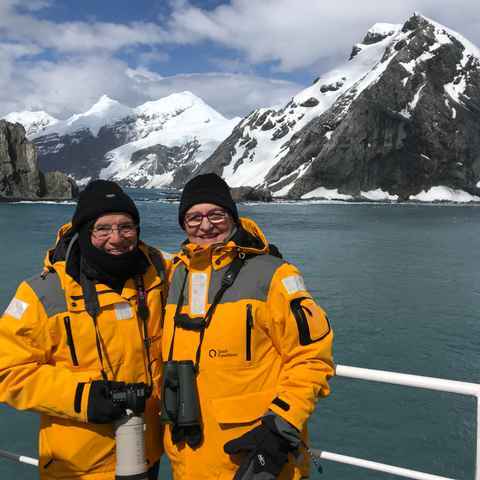 Very popular, particularly with wildlife enthusiasts, these trips cherry pick the highlights of the Southern Ocean with regular shore visits. Fly from the UK - There is also a regular direct flight to The Falklands operated by the RAC (UK military) from RAF Brize Norton in Oxfordshire, UK. This 18 hour flight goes via the Ascension Islands. Its expensive and you can’t book tickets more than a 2-3 months ahead, but it is the most direct routing from Europe. By Ship - Ship-based visitors now number over 60,000 a year having experienced significant growth over the last decade. With hotel accommodation, accessibility to the remoter islands and tourist facilities generally still quite limited, exploring by ship is very practical. Cruises of the Falkland Islands only are few in number. More common are voyages which include The Falklands, South Georgia and Antarctica in a loop of the Southern Ocean, which typically takes 18 - 23 days. Land-based - Travelling by land allows greater independence, more time in each place and the chance for a more immersive experience than the often fleeting visits by ship. The network of small B&B’s provide memorable overnight accommodation. Local guides can be arranged to accompany you and short hopper flights provide inter island access. For those visitors arriving by ship, accommodation onboard is already taken care of. For non-cruise travellers wishing to explore the islands, there’s a modest network of small, independently owned and run bed & breakfast’s and lodgings, which get progressively more rudimentary the further you foray from the capital, Stanley. How often are the flights from Chile? Once weekly on a Saturday. The flight takes approx. 1 hour 35 minutes. Do you need a visa to visit? In general, cruise ship visitors don’t require a visa for The Falklands or to participate in shore excursions. However, visitors arriving by air, or intending to spend time in the Falklands before or after a cruise, may need a visa. Where can you stay on The Falklands? There’s a modest network of small, independently owned and run bed & breakfast’s and lodgings, which get progressively more rudimentary the further you foray from the capital, Stanley. We loved every minute of it, just wish we could have spent a bit more time in Stanley, it looks so delightfully colonial like belonging to another age.